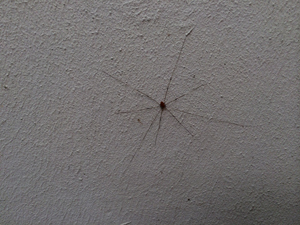 My house is overrun with daddy longlegs spiders? What can I do to eliminate them? 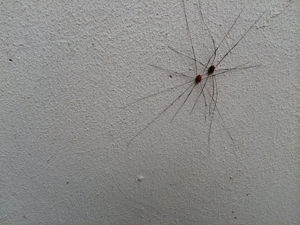 Rarely found inside homes, Granddaddy longlegs tend to congregate on the side of a house, in the basement, in the deep shade of woods near plant growth or under porches. They are sometimes a nuisance, but are not harmful to humans, animals, buildings, or crops. They feed on plant material, insects, earthworms, and slow moving or dead insects. The best way to control them inside is to toss them out; they do not bite. They are called harvestmen and while they are members of the class Arachnida, which also includes spiders, scorpions, and mites, they are not true spiders. Spiders have two body segments that are distinct and separated. 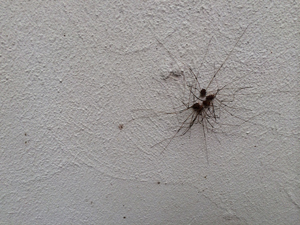 On harvestmen the two body segments appear fused into a single large body segment (like mites and ticks). Also, spiders have venomous fangs, whereas the fangs of harvestmen have no venom glands. Young harvestmen hatch from eggs and look like tiny versions of the adults. Most live for about a year and females lay eggs by the hundreds in moist soil. Harvestmen are sometimes eaten by birds, large spiders, and predatory insects. 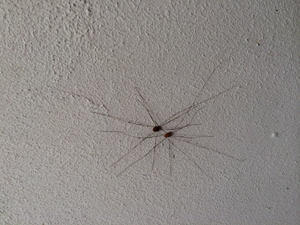 Enviroguard's pest management professional can treat your home for insects that serve as a food source for these harvestmen and that will reduce their number. Also cutting and clearing dead plants and raking leaves and clippings will also help. In some cases glue boards (a type of trap) can be used to rid you home of this nuisance pest.